1. Heat oven to 200C/fan 180C/gas 6. Lay the salmon with a board and, employing an apple corer, make 18 holes in rows of hree inside salmon fillet, just continuing to fall to the skin, although not cutting right through. 2. Take an item of sun-dried tomato with an olive and, employing a basil leaf like a wrapper, rollup into a tight little parcel. Each parcel needs to be just large enough to plug into one of several holes. 3. As you roll each parcel, stuff them into your holes until they all are filled. 4. Place the salmon fillet over a piece of greased foil with a baking tray, then season with salt and pepper and drizzle using the olive oil. Roast from the oven for 20 mins until just cooked. 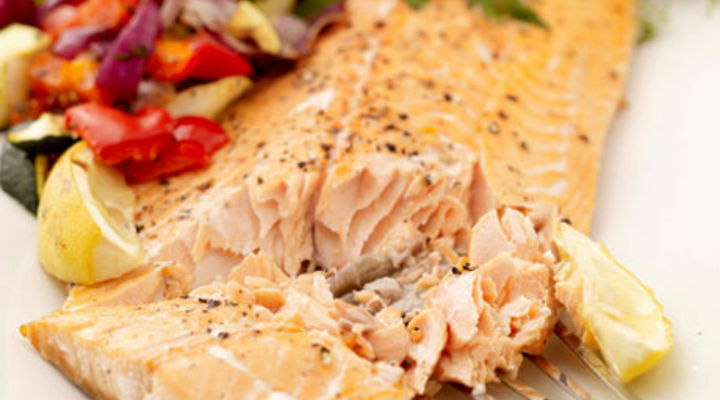 Remove through the oven by leaving to cool until just warm, then carefully lift the salmon onto a serving dish and serve, or leave for cooling completely (see Gordon’s tips, below).